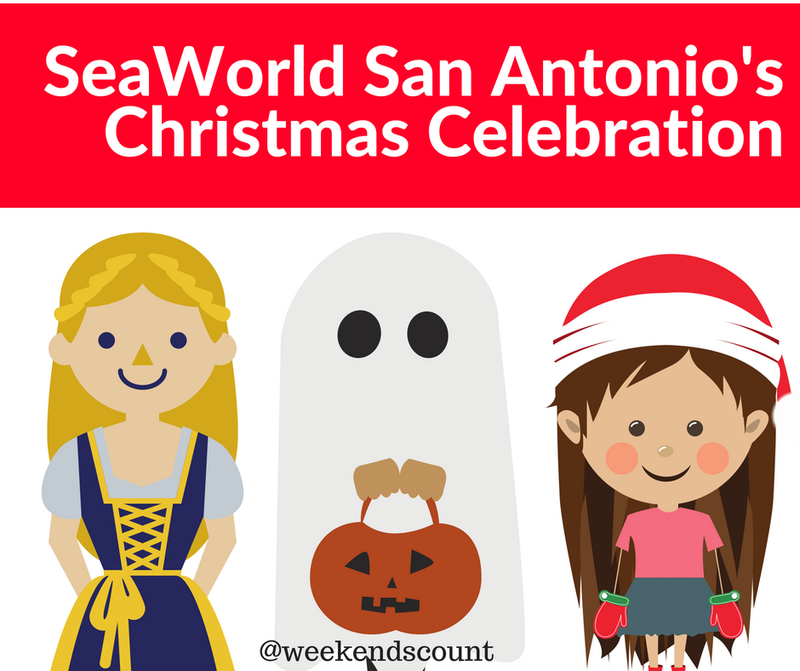 We LOVE SeaWorld and the activities that it offers families visiting the San Antonio area. 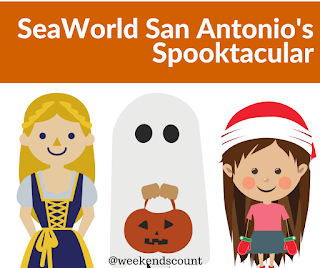 Fall is always an eventful time at SeaWorld because activities in September, October, and November include a wealth of FOOD and FUN for FAMILIES. From Bierfest (September 1st-16th) to Spooktacular & Howl-O-Scream (September 28th to October 28th, there are activities for everyone! For only $25, you can sample 10 beverages throughout Bier Fest! Also, you can attend several times during the event and use the same card throughout your visits! Treat yourself to two each visit. Here's a special deal for first responders! If you visit the park during Bier fest, you will receive one 12oz draft beverage per day! What a deal! Now, let's talk about the family-friendly, Spooktacular (September 28th - October 28th)! This activity includes treat or treating for the children, Halloween themed activities (including special shows), and special dining options! For this event, the park is sponsoring TWO Spooktacular shows, TWO exclusive dining experiences during Spooktacular, THREE photo opportunities. and a HAY MAZE! Here's a hint for parents: Make plans to exit the park BEFORE 7pm, that is when the scary stuff begins! Price for Spooktacular: Included in the price of admission. 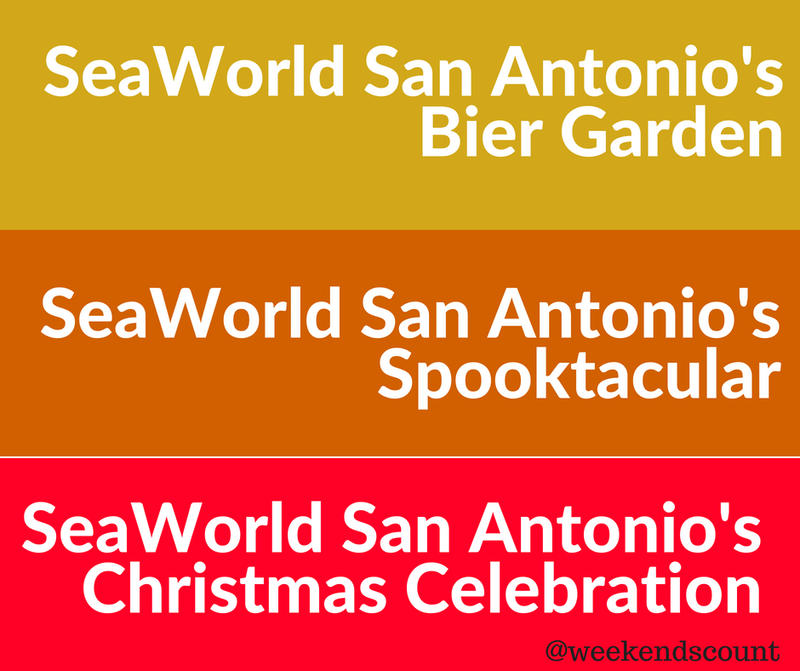 Now, let's talk about the family-friendly, SeaWorld's Christmas Celebration (November 17th - January 6th)! This activity includes numerous amazing lights, the most AMAZING and LARGEST Christmas light display in Texas, meet and greet opportunities with Rudolph the Red-Nosed Reindeer and friends. treat or treating for the children, Halloween themed activities (including special shows), and special dining options! For this event, the park is sponsoring Dinner with Santa, Dinner with Rudolph the Red-Nosed Reindeer, and Christmas Shows (ranging from Clyde & Seamore's Countdown to Christmas to Shamu Christmas: Miracles). Wait, they have more! From Merry Mariachis to Ho Ho Hoedown to the Nativity Singers, your family will definitely be in the holiday spirit as your prepare for Santa! 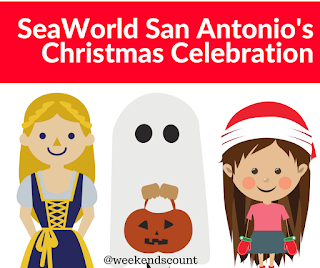 Price for SeaWorld's Christmas Celebration: Includes in the price of admission. Yes, it IS ALREADY the season for holidays! 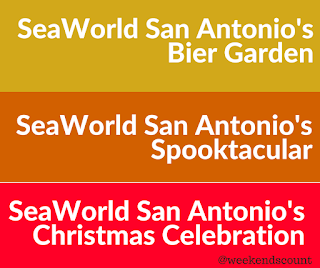 Embrace it and BOOK your family's experiences at SeaWorld today!